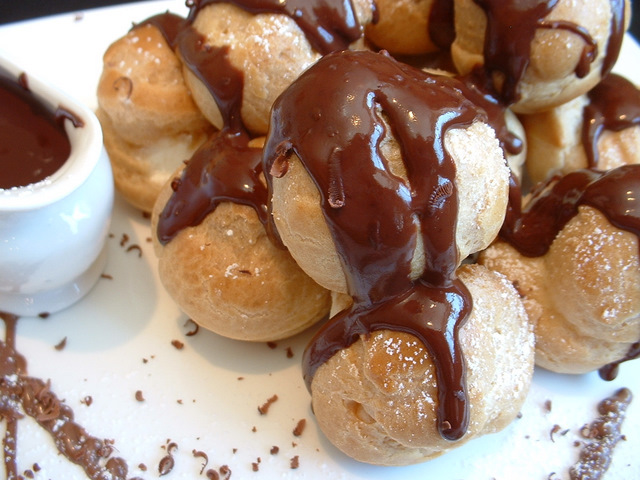 Choux pastry – all you need for profiteroles! Sieve the flour into a clean bowl. Pour the water into a saucepan and add the margarine. Place on the hob over a medium heat and bring gently to the boil. Allow the margarine to melt in the water. Using a wooden spoon, stir in the flour. Keep stirring until the mixture leaves the sides of the saucepan cleanly. Leave on the heat for a few more moments as we need to cook the flour. Break the eggs into a jug and beat. When your mixture in the saucepan is cool enough to touch, slowly beat in the beaten egg, again using a wooden spoon, making sure the egg is well incorporated into the mixture. Continue to add the egg until a nice smooth creamy paste is achieved. The choux pastry is now ready to use.